Peter Paul Mauser’s Model 98 shaped firearms history, and that iconic name now graces a new bolt gun pretty much anyone can afford. To say the Mauser 98 is one of the most influential bolt-action rifles of all time is an understatement. Peter Paul Mauser’s original design, with its massive claw extractor, has become the worldwide standard for bolt guns used for sporting and military applications. The DNA of the Mauser rifle can be seen in many of the top sporting rifles of our time, including the Winchester Model 70 and the CZ 550, and Africa’s professional hunters—a hard lot to please—still believe the Mauser 98 is the most reliable action for large, dangerous game. The Mauser 98 is once again in production in Germany. 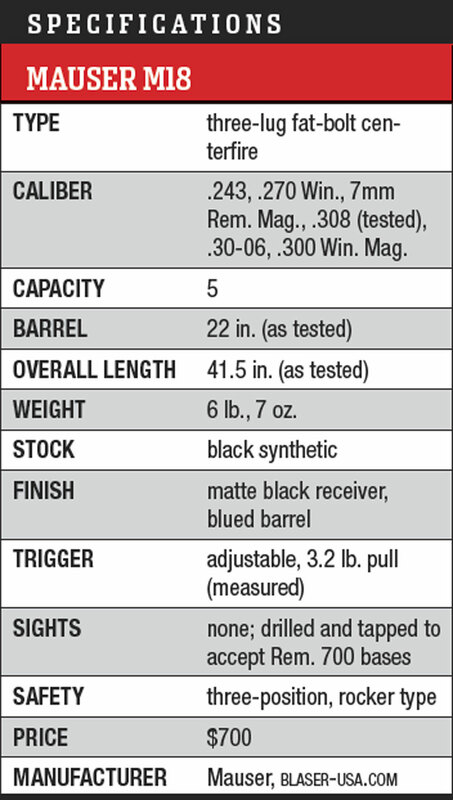 Last year in the pages of RifleShooter, I evaluated the current M98 Magnum Mauser rifle, which features a double square bridge receiver and hand-oiled grade V wood. The gun was elegant and built to high standards, but it costs more than $13,000. With such a lofty price tag, the modern German M98 Magnum exists in a different universe than the current crop of budget bolt-action hunting rifles and is well out of reach for most buyers who want to own an authentic Mauser rifle. Earlier this year, Mauser launched a brand-new rifle design: the M18. Nicknamed “the people’s rifle,” at $700 this newest Mauser is quite affordable and set to compete with the legion of budget-friendly bolt guns available today. It’s a departure from Peter Paul’s design to be sure, but the M18 incorporates many of the features found in other ultra-accurate, affordable bolt guns. Soft rubber inserts are located in the pistol grip and on the fore-end. These offer a firm but comfortable hold on the rifle. The M18 drops the controlled-round-feed design in favor of a modern push-feed bolt with three locking lugs up front, a pair of plunger-type ejectors and a small claw extractor mounted on one of the locking lugs. It’s a “fat bolt” design, which means the bolt body is the same overall diameter as the lugs, so cycling is smooth and slop-free. The Mauser’s three-lug design also allows for a short, 60-degree bolt lift for faster cycling, and the new M18 also utilizes a box magazine with the recessed release located in the bottom of the synthetic stock just ahead of the magazine well. The round bolt knob is oversized and easy to grasp, and the rear of the bolt shroud is enclosed with a cocking indicator with a red base that protrudes from an opening in the center of the bolt shroud when the Mauser is ready to fire. Mauser designed the bolt so it could be easily disassembled for routine maintenance. The M18 utilizes a cylindrical action with a “burnished black” (matte) finish and a minimized ejection port for added stability and improved accuracy. And speaking of accuracy, Mauser promises sub-m.o.a. groups for five shots—something you won’t find on many other bolt guns with price tags under $1,000. The three safety positions are demarcated by a trio of dots. The rearmost position is Safe, bolt locked; the middle position allows for cycling on Safe; forward is Fire. In keeping with tradition, the latest Mauser utilizes a three-position safety, but it’s not the traditional wing design found on the M98. Instead, it’s a rocker-type safety located on the right side of the action and acts directly on the trigger lug. The rearmost position locks the bolt, the center position allows the bolt to be manipulated with the safety engaged, and the forwardmost position readies the gun to fire. 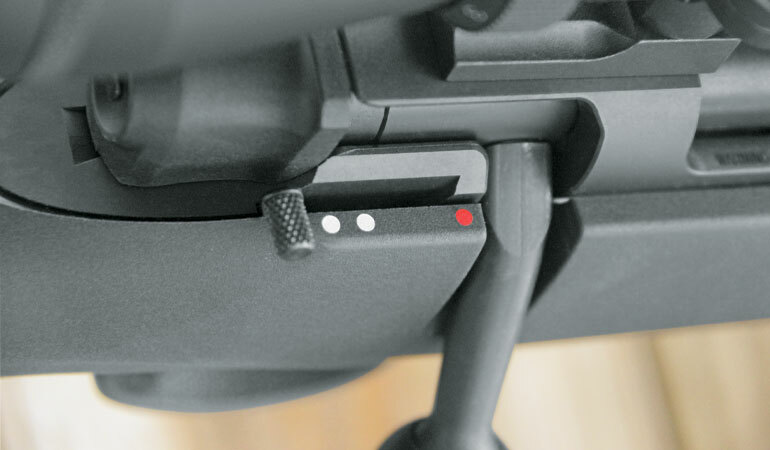 The small, cylindrical safety knob is textured and can be run through all three positions silently, and there are highly visible painted dots (two white, one red) to indicate the condition of the rifle. 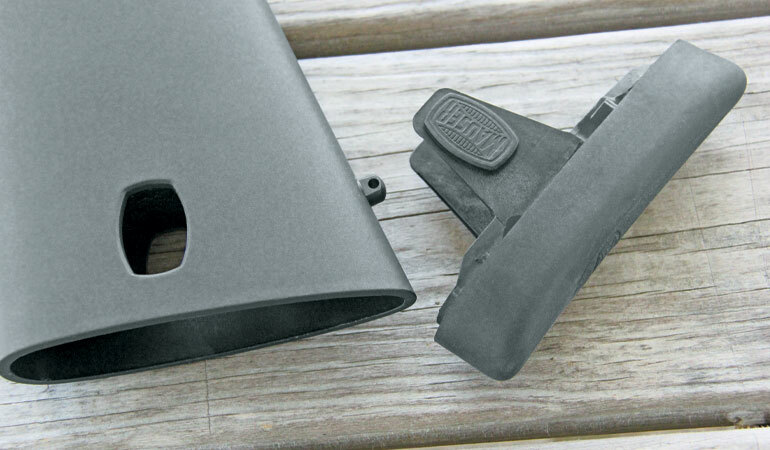 The trigger housing is molded into the polymer stock, and the trigger itself is externally adjustable. Using an Allen wrench while the rifle is completely unloaded, turn the screw in the top portion of the trigger clockwise to increase pull weight and counterclockwise to decrease pull weight. There are no artistic cuts or lines in the Mauser’s black polymer stock like those you’ll encounter on many contemporary bolt guns, but the M18’s design is classy and functional. The stock narrows to the pistol grip, and palm swells on the grip fill the hand comfortably and offer a stable hold when firing for both left- and right-handed shooters. 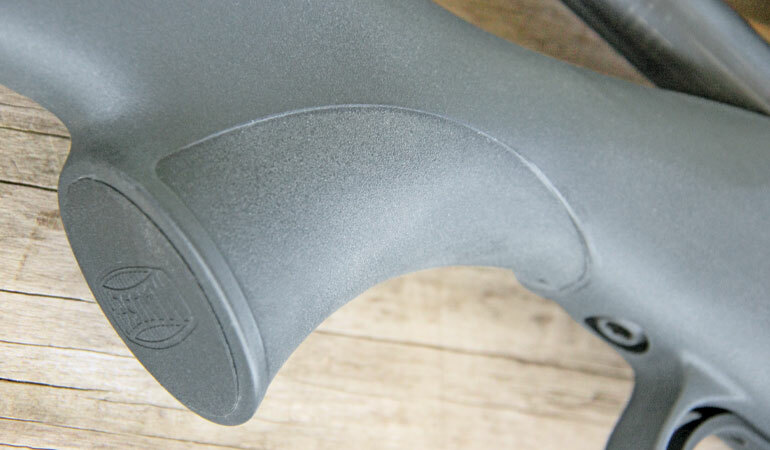 The fore-end narrows near the barrel channel, and there are soft-touch rubber inserts in the fore-end and grip that allow for a firm grasp on the gun. By pressing a button on both sides of the stock, the recoil pad can be removed—revealing a storage space for small items like bore snakes. The American-style comb is straight, and there are two buttons at the rear of the stock. When depressed, these allow the shooter to remove the recoil pad to store small items in the rear of the stock. One of the common complaints about injection-molded stocks on modern bolt rifles is they resonate like a drum when bumped or tapped—certainly not a feature you’d want in a hunting rifle. But Mauser has addressed this, and the inside of the M18’s stock is filled with foam to prevent excess noise that could potentially alert game. It’s a high-quality stock for an affordable rifle, with no odd seams created during the manufacturing process. In a world where some new rifles border on garish with their combination of avant-garde and new-age styling cues, the M18 is understated and purpose-built, which is a good thing. It’s not particularly fancy, but it’s engineered to perform. 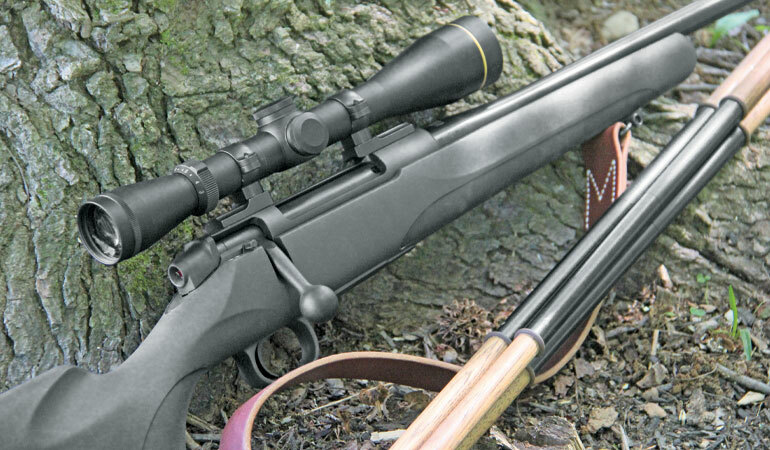 “Being able to produce a rifle this good at such an affordable price means that more sportsmen than ever before can realize their dream of owning a Mauser,” said Christian Socher, CEO of Blaser USA, Mauser’s San Antonio-based North American distributor. The M18 is available in standard and magnum calibers, and I opted to test the standard version chambered in .308 Win. The rifle weighs in at 6.7 pounds unloaded and unscoped, and with a Leupold XV-2 3-9x40mm optic mounted on Leupold bases, the total unloaded weight of the rifle was seven pounds, 10 ounces—a manageable weight for a hunting rifle. Standard calibers come with 22-inch blued, free-floated barrels for an overall length of just 41.5 inches, making the Mauser compact enough to be useful in a blind, tree stand or in dense cover. The magnum version adds two inches of barrel length and two ounces of overall weight. The lightweight polymer box magazine holds five rounds of ammunition. After bore-sighting the M18, I tested it with three different loads ranging from 130 to 175 grains. While the Mauser was especially fond of one particular load—Federal’s Edge TLR 175-grain ammo—it shot consistently with everything and produced average groups of 1.4 inches or less across the board. You’re probably saying the Mauser didn’t promise 1.4-inch three shot groups but rather five-shot groups under an inch. Fair enough. However, when the M18 finds a load it likes it’s capable of exceptionally good accuracy. The three groups with the Edge TLR ammunition measured in the 0.6- to 0.8-inch range. At the conclusion of the test, I had five rounds of the Federal Premium ammunition remaining. Our standard test protocol requires measuring three-shot groups at 100 yards for the overall average, but again, Mauser promises you can fit five rounds into an inch at that distance. So I tried, and everything was going fine until the fifth shot, which I pulled low and left. The group looked like it measured right at an inch, and the calipers placed it at 1.06 inches. The extra 0.06 inch was undoubtedly my fault, and the group was produced using sandbags in a stiff and unpredictable crosswind. Without question this gun is capable of sub-m.o.a. accuracy for five shots when the shooter does his or her part. I made several notations as I fired the rifle from the bench and from a standing position off sticks. First, the big, cushy recoil pad and straight comb do a fine job managing recoil. Although the .308 doesn’t produce excessive recoil, fatigue can build up when shooting for extended periods from the bench. 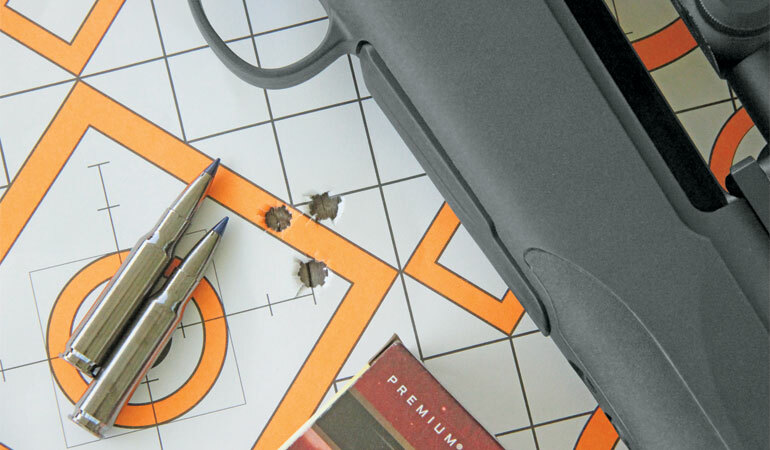 The Mauser’s generous recoil pad has a broad footprint that reduces the odds of pinching if the gun isn’t positioned properly, and the comb is smooth so there’s no sanding of the face with each shot. There were no issues with cycling, and the bolt runs smoothly through the raceway. Some rifles with small ejection ports are nigh impossible to top load, but you can easily drop a single round into the Mauser’s chamber when the gun is empty. While the M18 satisfied its accuracy guarantee with only Federal’s Edge load in Fitzpatrick’s test, groups like this 0.67-incher show it is more than capable of delivering. Some budget rifles come equipped with cheap mags that are finicky about the positioning of the cartridge in the box. Not so with the M18. The Mauser magazine seems durable, is easy to load and fits precisely into the magazine well without any fuss. Additionally, the positioning of the magazine release allows for easy, reliable mag drops, and the recessed design means you won’t have to worry you’ll accidentally lose your magazine when maneuvering through thick brush. Likewise, the three-position safety is, to my mind, a major upgrade from a two-position safety—not only because it allows you to load and unload the rifle with the safety engaged, but also because the bolt won’t hang on brush and accidentally open, which I’ve dealt with on hunts in the past. However, removing the bolt is simple thanks to a large, easy-to-find lever located on the left rear portion of the receiver, and the bolt shroud offers an extra measure of safety. The rubber inserts in the pistol grip and fore-end are functional and comfortable, and the pistol grip itself is large enough to shoot comfortably from a bench. The M18 offers one of the best single-stage adjustable triggers you’ll find on any affordable bolt action. On my test rifle the trigger broke cleanly at 3.2 pounds with little creep or overtravel. Storage space in the stock is minimal, but there’s enough room inside to carry a bore snake or small cleaning cloth, which is a nice touch. Both the matte black finish on the receiver and the bluing on the barrel are durable and stand up to abuse. Balance is excellent, and this rifle points naturally. Will these features be enough to make the M18 the “people’s rifle”? That remains to be seen. Surely, there are those who will buy it simply because they want to own a German-made Mauser, but brand cachet is not the only reason to buy this gun. It’s light enough to carry all day, offers one of the best triggers at this price point, and it’s both reliable and accurate. The budget-rifle market is crowded and competitive, and any new gun that is released will be expected to perform at a high level. The Mauser does just that. Hopefully, the M18 family will continue to grow, and over the coming years perhaps we’ll see more variants of this new German hunting rifle. For now, the M18 is a versatile and affordable hunting rifle that will appeal to the masses. I believe Peter Paul Mauser would approve.